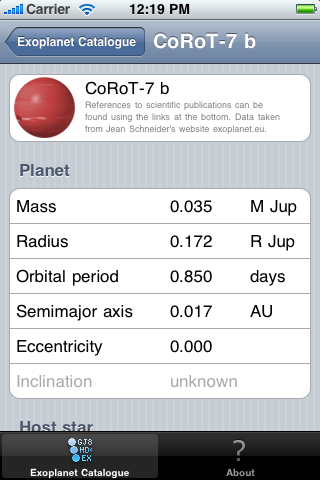 Three iPhone apps which are related to the planet formation process are available from the Appstore. Exoplanet is a database of extrasolar planets. It contains details of all detected exo-planets as well as their host stars. One can easily sort and search through the database and view pictures of the host star as well as visualisations of the planet’s orbit. Links to different online resources such as exoplanet.eu and the arXiv are provided for each planet. It can be downloaded free of charge from Apple’s AppStore. 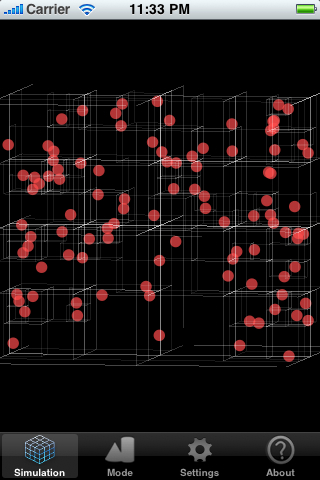 This program visualizes a tree based gravity solver. Several hundred particles in a box with periodic boundary conditions are simulated and displayed in real time on your iPhone. Exactly the same simulation also runs on supercomputing facilities. It can be used to model the formation of planetesimals. Planetesimals are the building blocks of planets in the early solar system. Because of self-gravity planetesimals clump and eventually form planets. However, to model the physical processes realistically, one has to use many more particles than the iPhone can handle (hundreds of thousands). The original idea of a tree code is based on a nature paper by J. Barnes and P. Hut (Nature, 324(4):446-449, December 1986). A recent scientific publication describing some details of this particular code is available for free at http://arxiv.org/abs/1001.0109. Hydro is a ZEUS-like MHD (magneto hydrodynamics) code specialised for cylindrical and spherical coordinate systems. It uses the FARGO advection scheme. All simulations included in this app run on a 64×64 grid with a solar mass star located in the centre of the accretion disc.